Fantastic photo opportunites – make sure you bring the camera! Incredible views of Dubai’s stunning cityscape are guaranteed on this thrilling boat ride. Cruise around the curve of the Palm Jumeirah island and admire the visionary developments taking place there. Get a glimpse of the ultimate in high living when you pass the opulent villas and penthouses designed for the super-rich. Admire fabulous resorts like the Atlantis and Madinat Jumeirah. Elegantly designed to resemble a billowing sail, this towering landmark houses the world’s most luxurious hotel. 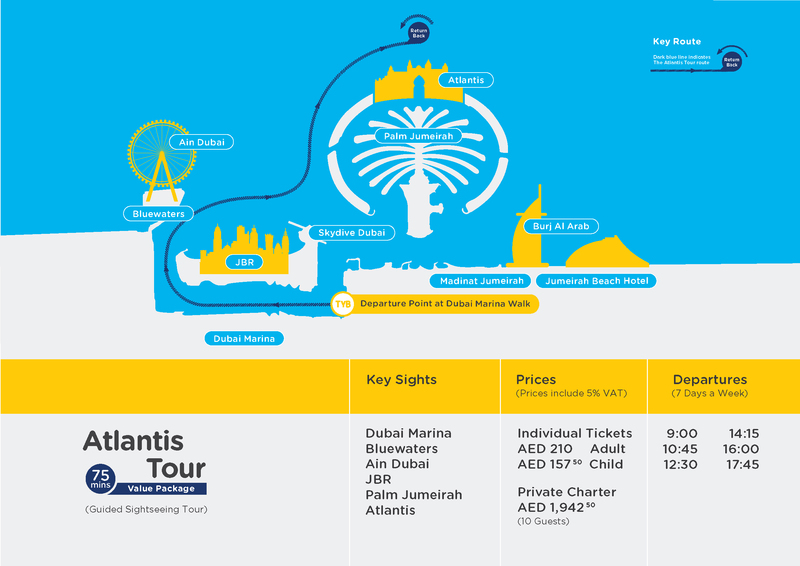 This exciting 75-minute trip gives you magnificent views of Dubai from Dubai Marina to Atlantis the Palm and back, passing sights such as Palm Jumeirah, JBR, Bluewaters Island and Ain Dubai. The Palm Jumeirah Boat Tour gives you breath-taking views of Dubai’s amazing skyline from the water. To join the tour, make your way to Dubai Marina Walk to board your craft. This trip takes place in a high-power speed boat but for this sightseeing tour your speed will not exceed 26 knots! As you cruise northward from the Marina with the wind in your hair, spectacular views of Dubai’s coastline will appear along the horizon and your skipper will point out the main highlights. You will see the amazing Palm Jumeirah, an artificially created island in the shape of a palm tree. The island is designed for developments of unprecedented luxury including villas, resorts, hotels and fabulous shopping malls. One of the earliest buildings to be completed was the fantastic Atlantis Resort, situated at the ‘top of the palm tree’ and overlooking the Arabian Gulf. The boat will stop for 5 minutes in front of the Atlantis for a photo opportunity and commentary. Further up the coast you will see the Madinat Jumeirah, a splendid Arabian-themed resort. Basically, our 75 minutes Guided Sightseeing Tour takes you from Dubai Marina to Atlantis the Palm and back, passing sights such as Palm Jumeirah, JBR, Bluewaters Island and Ain Dubai. Your boat returns to Dubai Marina at the end of the 75-minute cruise, and you should make your own arrangements for getting to your next destination. Excellent city views and Atlantis hotel from the water.